Float plane (also called sea plane) flights leave Vancouver more than 20 times daily. Planes leave from Coal Harbour, in downtown Vancouver, in front of the Vancouver Convention Centre. They fly from downtown Vancouver to Victoria, Nanaimo and Whistler. There are also flights between Vancouver airport’s South Terminal and Victoria or Nanaimo. Victoria also has flights to and from Whistler during the summer. 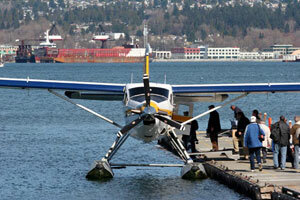 In Victoria, float planes arrive and depart from Victoria’s Inner Harbour, only 5 minutes from the Empress Hotel. You can access up-to-the-minute float plane schedules and make reservations online, by Email or by calling 604-990-9299 or 1-800-913-9207. Airport flights depart from the South Terminal 15 minutes from the Vancouver International Airport. A courtesy shuttle service is available to and from the float plane dock at the South Terminal. Vancouver Panorama Tours – Three Panorama tours are available: 10 minute, 20 minute and 35 minute. These tours give you a chance to see the city and surrounding water and wilderness from the air. There is no better way to appreciate Vancouver’s incredible location, balanced between the water and the wilds, than to experience by float plane. Flights are available daily year round, weather permitting. For more information, visit the Panorama Information page. Victoria Fly and Ferry– This all day package is really perfect. You take off from Vancouver’s downtown harbour by float plane for a 30 minute flight to downtown Victoria. You’ll land in Victoria’s Inner Harbour, just 5 minutes from the Empress Hotel. Flights leave Vancouver for Victoria every 20-30 minutes in the morning and you can fly when you want. Once you’ve had a chance to explore Victoria and visit the Butchart Gardens (optional), go whale watching (optional) or enjoy high tea at the Empress (optional), you will board a bus in Victoria for the 40 minute drive to the ferry terminal at Swartz Bay and your return to downtown Vancouver. Buffet dinner (optional) is available on the ferry. The Mail Run– Fly on a scheduled run to the delightful Ganges Harbour on Saltspring Island on this interesting tour. Spend time exploring the small shops or rent a bike! For more information, visit our Mail Run information page, Email or BOOK NOW. Horseshoe Bay Fly and Dine– This evening adventure begins at 6 or 7:00 PM, depending on the season. It includes a 20 minute Panorama flight from Vancouver’s downtown harbour to Snug Cove on Bowen Island. Zodiac Dine and Fly– This 5 hour afternoon experience (beginning between 12:00 – 3:00 PM, depending on the season) includes pick up at your hotel, transportation to Horseshoe Bay, a 30 minute scenic drive from downtown. When you reach Horseshoe Bay, you will dress in Expedition suits for your two hour guided nature tour by Zodiac, a 12 person inflatable, open boat. At the conclusion of the tour, you’ll shed your expedition suit and stroll to the Doc Morgan’s restaurant for an early two course dinner.